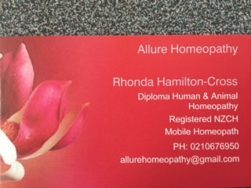 I am a registered homeopath and have a Diploma in both human and animal homeopathy. I love seeing the difference homeopathy can make to both animal’s and human’s lives. From dealing with the mental emotional issues of fears, anxieties, grief or loss to the physicals of acute illnesses such as cuts, burns or bites and stings through to chronic illnesses – the list is endless. Homeopathy is a safe and effective way of looking at an individual’s case and then prescribing a remedy or remedies to assist them in getting them back to a more balanced state of health.